Warrington, S. (2018). Push, don’t pull: One self-access center’s struggle for an identity. Studies in Self-Access Learning Journal, 9(2), 147-155. In Japan, there are a number of self-access centres which, through hard work, collaboration and support, have succeeded in establishing unique identities for themselves. However, as encouraging as this is, there are still university-based self-access centres within the country where the opposite is true. In this article, one self-access centre’s struggle to form a unique identity for itself will be examined. Discussion will first focus on understanding the history of the centre and underlying reasons for why this problem persists. Thereafter, attention will be turned to ambitious efforts being made to deal with the issue in light of long-standing limitations imposed by the university’s administration. Creating a successful self-access centre at a Japanese university is something that is far from simple. Indeed, establishing and maintaining one grounded in the principles of learner autonomy is something which not only requires much planning, organisation, and negotiation but also much time, financing, and effort (Sheerin, 1991). However, there are undoubtedly some university self-access centres within the country which, despite the availability of funds for their operations and development, have regrettably seen little to no change and progress. This appears to be the result of a combination of factors, which may include a lack of proper planning and foresight on the location and management of a self-access centre, inflexible policy, and lack of support and conflicting interests from university administration (Anderson, Reinders, & Jones-Parry, 2004; Brown, Adamson, & Fujimoto-Adamson, 2011; Mynard, 2012). Hence, taken together, the impact of these factors can make it quite difficult for such self-access centres to project the kind of identity they aspire to and be discerned and identified as self-access centres at all. This appears to be the case for the self-access centre at Nagoya University of Commerce & Business where I currently teach and serve as the head of the self-access committee in the Department of English. However, in order to truly understand the specific reasons for this particular identity problem, it is first necessary to discuss the history of the university’s self-access centre—its establishment (why it was created and its theoretical underpinnings), location, mission, policy and subsequent management—as a means to show why action is requisite. The self-access centre (SAC) at Nagoya University of Commerce & Business (NUCB) was first opened in April 1998 (Monk & Ozawa, 2002). As one of the first self-access centres in Japan, its creation was a direct response to what was, at that time, a growing trend in developing institutional self-access centres for language learning in Japan as a way to attract and recruit the depreciating number of high school students in an increasingly competitive higher education market (Monk & Ozawa, 2005). Moreover, as Monk and Ozawa (2005) further describe, it was seen as a way of extending what students learned in their English language classes. Thus, in this sense, it was established for pragmatic purposes echoing the findings from Anderson et al.’s (2004) study. Most of the theoretical thinking for its foundation was built around the ideas of Sheerin (1989) and Gardner and Miller (1999) who first advocated establishing one (Monk & Ozawa, 2002). It was also from these works that the grounds for creating the SAC were based and justified to the university administration. In terms of location, it was decided after some discussion with the university administration that the SAC would be situated on the first floor of NUCB’s Nisshin campus library (Monk & Ozawa, 2002, 2005). According to Hadley and Brown (2007), it is not uncommon for a SAC to be placed in a library. Indeed, as Mach (2015) states, “very few institutions are able to devote entire buildings to a SAC facility” (p. 10). Yet, little attention is given to the fact that this can lead to competition between a SAC and a library as a place of learning (Gromik, 2015). This can be especially true if both are “informed by outdated ideas of how to learn” (Edlin, 2016, p. 117) or a SAC is founded and situated without a robust pedagogical rationale (Benson, 2001). Such competition can also occur if the space a SAC comes to exist in inherits purposes and functions which directly conflict with what it is envisioned for (Mach, 2015). Yet, according to Monk and Ozawa (2002), the decision to situate NUCB’s SAC in the library was deemed appropriate and “fortunate” for three reasons (p.50). First, it was thought such a location would provide sufficient space. Second, it was believed that it would allow students easy access to other resources as well as library and SAC personnel for assistance. Third, and most importantly, it was also assumed that such a location would help the SAC form its own particular and “very definite” identity (Monk & Ozawa, 2005, p.122) and allow it to “flourish” (Monk & Ozawa, 2002, p. 50). However, in stating this, Monk and Ozawa (2002, 2005) provide no insight on the SAC identity envisioned. From 1998 to 2001, there was no stated mission or policy for the SAC and its administration. However, within this time frame, ideas for both began to circulate as a result of the university’s financial investment in the SAC and its strong desire to see results with respect to the number of users (Monk & Ozawa, 2002)—a practice not unheard of as a means to a “statistical boost in reporting figures” (Swanson & Yahiro, 2012, p.117). This invariably meant that some sort of mission and policy would need to be established. To this end, a mission was finally introduced in 2002 and a policy in 2004 (Monk & Ozawa, 2005). In terms of the former, it was stipulated that the SAC is to be an integral part of course work, and function or serve, to reiterate, as an extension of the classroom—a place for students to do assignments and study for exams (Monk & Ozawa, 2002, 2005). As for the latter, all students are required to attend the SAC at least once a week for 100 minutes (equivalent to one class period) over 12 weeks or 20 hours per semester (Monk & Ozawa, 2005). This is to be in addition to the 17 hours they must spend in the classroom for coursework (Monk & Ozawa, 2005). For each visit, students must swipe their ID cards through a reader upon entering and, once again, upon exiting the library (where the SAC is housed) which records their total time. Although mandatory, this time requirement is not necessarily unusual as some believe it is “the most common way” for self-access centres to “encourage students to take part” (Swanson & Yahiro, 2012, p.116). Yet, it appears this approach was taken for a different reason. Indeed, according to Monk and Ozawa (2002, 2005), NUCB’s SAC policy is grounded in and was formed on the assumption that students would not attend the SAC voluntarily and that some sort of coercive measures were needed to prompt them. This was further justified by their citing of Gardner and Miller’s (1999) contention that self-access needs to be part of policy in highly structured institutions especially when first introduced rather than, as Cooker (2010) argues, non-compulsory and a choice a learner makes. Consequently, those students who do attend the SAC the required number of times and are not absent more than three times receive credit (Monk & Ozawa, 2005). Those who do not attend the required number of times lose it along with the right to take final examinations for specific courses (Monk & Ozawa, 2005). This policy continues to remain in place to the present day. Despite having a SAC manager, volunteer full-time faculty from the Department of English and a SAC committee composed of faculty from the latter (including me), not one of us has any jurisdiction over the self-access centre. Instead, the head of the library has authority as a result of the SAC being housed within it and imposes the rules made by the university administration. The SAC manager must therefore report to and also seek permission to do anything new from this individual. Likewise, volunteers and SAC committee members must also seek such permission by speaking to the SAC manager first who then conveys the request to the library head. Hence, given these circumstances, the SAC does not have rules of its own nor has it historically ever had any. Regulation-wise, students are told they must study quietly in the SAC and noise must be kept to a minimum. Failure to do so can result in expulsion from the SAC and the library. This even applies to group study rooms despite the well documented benefits of such social spaces for language learning, knowledge enhancement, global citizenship and glocalization (Murray & Fujishima, 2013, 2016; Murray, Uzuka, & Fujishima, 2017). What is more, only full-time faculty volunteers and SAC committee members are permitted to regularly communicate with students since they have been deemed as better suited to advise and counsel on an impromptu basis. The SAC manager, in contrast, is discouraged from taking such action with students and expected, as the position title suggests, to just “manage” the SAC–handle its daily administration and operations. However, this was previously not the case. Indeed, up until 2016, there were three other SAC staff members (inclusive of a SAC manager) handling such impromptu advising and counselling duties with students. Yet, with their unexpected and unfortunate departure over the past two years, the university decided not to hire new SAC staff, leaving just one person to be the SAC manager and run the centre. The result of this move has been the complete shift of advising and counselling responsibilities to volunteers and SAC committee members to cover what was previously undertaken by SAC staff. Besides this, the SAC manager, volunteers and SAC committee members and I continue to be prohibited from permanently displaying or making use of signs, posters or papers to attract students and foster interest in self-access for language learning. We are instead limited to the use of a small billboard and a few floor stands which must be removed by the end of each day. Hence, taken together, these and the other aforementioned SAC rules continue to remain an issue of contention to this very day and are undoubtedly rooted in the decision to situate the SAC in the library as well as the lack of insight and foresight on what the impact of this might be. Since the SAC’s inception, a “push” rather than “push-pull” strategy (Croker & Ashurova, 2012) has been implemented based on assumptions made about student behaviour and as a way to meet the university administration’s desire to see high student attendance numbers (Monk & Ozawa, 2002, 2005). Hence, it continues to exist and function as a place learners “have to be” rather than somewhere they “want to be” (Hadley & Brown, 2007, p.31) despite the ongoing efforts of the SAC manager, volunteers and the SAC committee to pull students to the centre via various learning tasks, activities and social events. Indeed, the university’s positioning of the SAC has undoubtedly had an impact on how students ultimately position it, giving credence to the notion that a SAC is or can become a very different metaphor for related, relevant parties (Brown et al., 2011). This was made evident from a study by Warrington and Lan (2017) which found that, for many NUCB students in the Department of English, the SAC is perceived as indistinguishable from the library and a place simply to do assignments as a result of being unsure what to do otherwise. Thus, it continues to fall among those SACs which have come to be seen or treated “more like homework rooms” (Mynard, 2012, p.1). Such a perception stands not only as a repercussion of mission, policy and management but also in stark contrast to the university administration’s desire to see the SAC as some sort of number generating turnstile for its statistical benefit (Monk & Ozawa, 2002, 2005). Yet, neither the former nor the latter metaphor reflects an identity congruent with self-access. Nor are they symbolic of the ideal we (the SAC committee members and I, the SAC manager and the volunteers) want and desire as advocates of self-access—individual and social language learning of a ubiquitous nature (Benson, 2017; Murray, 2014). To this end, Monk and Ozawa’s (2002) claim that the SAC would, to reiterate, come into a “very definite” identity of its own has only proved to be invalid (p.50). In light of the problems faced in establishing a SAC identity congruent with self-access, three specific and ambitious efforts have been made to resolve this issue. First, attention has been turned to clarifying the meaning of self-access while strongly emphasizing the ubiquity of it to students as a way for them to perceive and position the SAC differently. According to Benson (2017), “a SAC is not a ‘learning environment’ in and of itself. It is, instead, one among many ‘settings’ for language learning that potentially make up the language learning environments of its users” (p.142). With this point in mind, the SAC manager and I along with fellow faculty volunteers and SAC committee members have started putting far more effort into stressing and promoting self-access as something which can be done anywhere—in the settings or spaces of physical and virtual learning environments—and anytime by students individually and socially. This came about as a direct response to the findings from Warrington and Lan’s (2017) study where many NUCB students from the Department of English revealed they either did not understand or misunderstood the concept of self-access and associated it as something quite specific to but not beyond the physical location of the SAC. Yet, this is not necessarily surprising given the students have been and continue to be coerced into visiting the SAC while being restricted in terms of what they can do and what can be offered to them. A second related effort has involved the SAC committee exploring the prospects of creating and using a virtual “affinity space” as another setting for the SAC (Gee, 2005). A virtual affinity space is an interest-driven website which various individuals come to affiliate with and learn informally through as a result of a “common cause and the practices associated with espousing it” (Gee, 2005, p.229). If designed and implemented, such a space would likely take the form of a SAC homepage which allows for and promotes informal English language learning through, as Gee (2005) and Gee and Hayes (2011) contend, an endeavour of mutual interest. In addition, the SAC committee is looking at using SNS for the SAC (e.g. Twitter, Facebook, etc.) to spark communication about this virtual affinity space and amass interest in it via a needs analysis. The decision to take a virtual direction is grounded in three principles. One is that virtual domains are perceived as important learning contexts for L2 learners with many of their first interactions in another language occurring online (Hafner, Chik, & Jones, 2013; Vannini & Burgess, 2009). Another is that “for many individuals, performing competent identities in second and additional languages(s) now involves Internet mediation as or more often than face-to-face and non-digital forms of communication” (Thorne & Black, 2007, p. 149). Lastly, it is about not just providing something “parallel” to the physical space of a SAC (Mynard, 2012, p. 4) but a viable alternative functioning as a “space of possibility” (Jiménez Raya, 2017, p.23). That is, one which overcomes the limitations of a SAC in the real world and has the potential to offer a new or better set of affordances through the emergence of a “projective identity”—a virtual SAC identity taken on “as a real world identity” (Gee, 2003, p.66). A third and final effort to resolve the SAC identity issue was the acceptance of a proposal put forth by the SAC committee members and me to create learning-how-to-learn courses on self-access. Given the shifting landscape of self-access and the need to promote learner autonomy (Mynard, 2016) and its ubiquity amongst NUCB students, this agreement came about via extensive negotiations with the office of educational affairs throughout November and December 2017. These credit bearing courses aimed to encourage student engagement in ubiquitous self-access and use of the SAC and its resources. All courses were to be held in the SAC and offered nine times a week over each semester. What is more, it was agreed that these courses warranted abolishing the long standing mandatory attendance policy for the SAC. Since the students would be required to often visit the SAC to attend these courses, they would naturally have to swipe their ID cards upon entering and exiting the library. Hence, it was accepted that the number of student visits to the SAC would increase, be recorded and provide a statistical benefit to the university. However, between February and March 2018, the university administration reversed its decision and decided these “courses” would no longer be classified as courses or for credit. Instead, it decided they would be non-credit sessions and compulsory for students to attend at least one out of the nine 100 minute sessions offered per week over 12 weeks. What is more, the administration specified that the focus of these sessions is to be on raising students’ Test of English for International Communication (TOEIC) scores, leaving little to no room for student choice as to what they want to learn and improve in terms of English language. To this end, the struggle for NUCB’s SAC identity continues with the emphasis on the clarity and ubiquity of self-access and the virtual direction now appearing as the only feasible pathways to forging an identity in harmony with self-access. 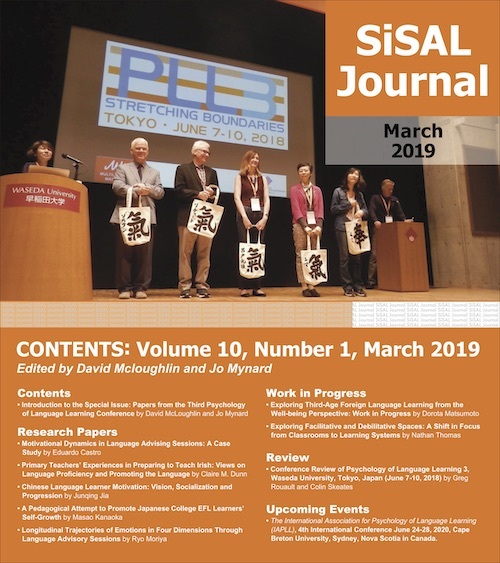 This article has discussed the unfortunate past of a SAC at one Japanese university and the ongoing struggle to forge an identity for it congruent with self-access. It serves as an example for other SACs facing the same issue of how important it is to examine and understand the history of one’s SAC and to problematise its principles. What is more, it highlights the importance of trying to reach a compromise while always striving to be resolutely innovative when facing a top-down administration with a very different perception of self-access. Finally, it espouses the view that as self-access is something ubiquitous, a SAC should not be limited to one learning environment. Instead, given the presence of physical and virtual learning environments, it should be positioned as something which can exist in either or both, depending on the varying and/or potential limitations of and affordances for individual and social learning within and across the inherent settings or spaces of each. Stuart Warrington, Ed.D. (TESOL), is an associate professor in the Department of English within the Faculty of Global Studies and the head of the Self-Access Centre (SAC) committee at Nagoya University of Commerce & Business. His research interests include self-access, learner autonomy, L2 digital literacy, mobile-assisted language learning and professionalism in ELT. Gee, J. P. (2005). Semiotic social spaces and affinity spaces: From the age of mythology to today‘s schools. In Barton, D. and Tusting, K., (Eds.) Beyond communities of practice. Language, power, and social context (pp. 214–232). Cambridge, UK: Cambridge University Press. Gee, J. P., & Hayes, E. R. (2011). Language and learning in the digital age. Oxford, UK: Routledge. Hafner, C. A., Chik, A., & Jones, R. H. (2013). Engaging with digital literacies in TESOL. TESOL Quarterly, 47(4), 812-815. Monk, B., & Ozawa, K. (2002). Establishing a self-access center in a Japanese university. NUCB Journal of Language Culture and Communication, 4(2), 49-58. Monk, B., & Ozawa, K. (2005). The NUCB self-access centre and its role in the foreign language program. NUCB Journal of Language Culture and Communication, 7(1), 121-134. Vannini, P., & Burgess, S. (2009). Authenticity as motivation and aesthetic experience. In P. Vannini & J. P. Williams (Eds. ), Authenticity in culture, self, and society (pp. 103-120). Farnham, UK: Ashgate Publishing Ltd.
Warrington, S. D., & Lan, Y. (2017). Self-access for active learning: A case study from Japan. Manuscript in preparation.